Be very careful where you purchase ground rabbit meats. This article is only to inform you of the possible problems your kitty may have with ground rabbit and to help you become more educated on how rabbit bones should be ground for better digesting. We also want to warn you of the possibility of damages to your felines internal system with raw bones that are not ground properly. We know that a felines acidic digestive system is made to digest raw bones but under normal conditions in the wild a feline would grind her own bones with their teeth, knowing what pieces she can digest and can’t. The larger the cat the larger the cats teeth to be able to grind the bones they can digest properly. Domestic size cats would eat the parts of the SMALL prey that are soft, snap like spaghetti and could chew and shear the bone easily. Feline Instincts felines were eating ground Rabbit for about two months. At first our kitties had no problem eating or digesting the rabbit. Then on or about 8/15/06, King Ramses started to throw up undigested food or fur with bones in it! Then King Tut threw some bones up with his fur balls. These bones were larger than normally ground bones should be. These bones had jagged and pointed edges, sharp enough to prick your fingers. I imagined the damages inside my felines this could cause if not digested properly. And what could be happening inside them when these sharp jagged bones were coming back out? I assumed that punctures to their intestines were likely. We emailed the company we ordered this ground rabbit from – asking how they ground their rabbits, but so far no reply. 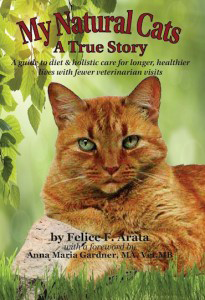 We explained our problems and concerns with this diet to both our holistic vet Dr Gardner and a friend we know who also feeds rabbit to their felines. Below is one customers experience with ground rabbit and her kitty. I have left out her name to protect her from any damages to her from the company that sells this ground rabbit. I have left out the name of the raw food company to protect everyone. Question: Is the problem that rabbit bone is not broken down by the feline’s stomach acid? How is it that they can eat rabbit in the wild then? Answer: The way the meat is ground probably plays a part, as they would eat the parts of the prey that are soft, snap like spaghetti and could chew and shear the bone easily. However, they probably would not be sharp like those larger femur ground bones processed artificially by grinding. Dr Gardner replied that we should be very cautious with ground rabbit bones, and to make sure they are ground twice…finely and consistently. I would have to say (rather sadly because I did not realize the seriousness of it until after the fact) that one of our felines used to occasionally vomit up shards of rabbit bone and (over the course of 8 years) he eventually developed a stomach ulcer!! I’m not saying that it was the rabbit bones that gave him the ulcer, but I do think (in retrospect) that they certainly took a toll on his digestive abilities over time. The condition was only diagnosed after he began losing weight and increased vomiting. At this point is was no longer bones, (but blood and bile) During that time I had to alter his regular food (no bones) as he had several weeks of severe digestive problems and unable to digest some important supplements (prescribed by our holistic vet) he ended up with irregular heartbeats (starving his heart of B vitamins, calcium, and others), culminating in congestive heart failure and about a month later, death. Now, he was 16 and had a history of very minor digestive problems and we just had a new baby. So maybe Herschel’s situation was completely unique and this would not at all apply to your felines…that said, knowing what I know about the slight possibility of bone irritation in the digestive system- I would not give ground bones to a feline with digestive sensitivity- especially if it is geriatric and has ever shown itself to be sensitive to bones. Also, I was told by our local source for ground rabbit that their bones are really difficult to grind small enough (they jam the grinders even) and this is why there are so many chunks. However, Herschel did really well on Jaque’s rabbit for quite a few years (minimal vomiting) and his problems really seemed to spike when we switched to another company (the same company Feline Instincts was using). Before I recommend ground bones, I just had to pass on feline Herschel’s story – just something to think about in case you’ve got one with a similar tendency. I did have to take feline Sammy Girl off the ‘pre ground raw rabbit’ she started to vomit frequently .